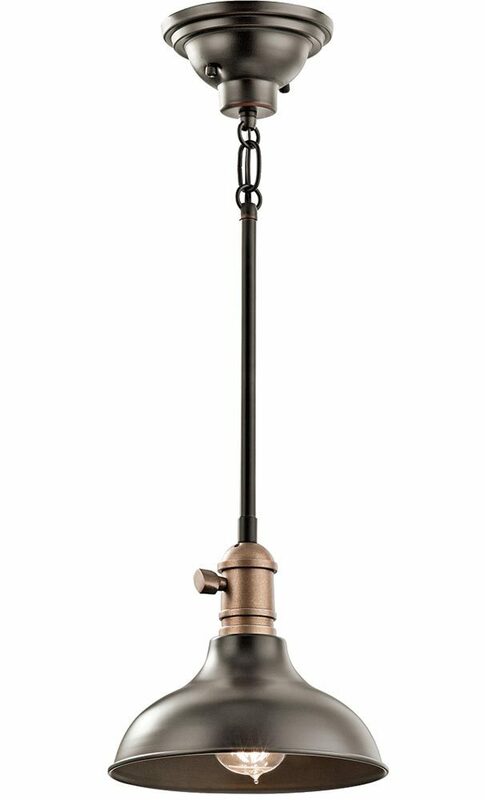 This Kichler Cobson industrial 1 light mini pendant ceiling light in olde bronze finish boasts retro period style and timeless appeal. Featuring a domed circular ceiling mount, rod suspension and domed 20cm shade, with gunmetal shade fitter and downward facing bare lamp bulb. The solid metal shade ensures that all of the available light is directed downwards, making it ideal for us with a vintage style filament lamp and installing over a table. Light up your home with this retro industrial collection. Featuring a timeless bell shade and decorative paddle switch it will take you back in time while giving your home a sleek new touch. Available in natural brass, olde bronze and polished nickel. This industrial style light is supplied with two 15cm and two 30cm rods that can be used in any combination to achieve the perfect drop. Please see the technical information below for dimensions. The transitional style and olde bronze finish allows this fitting to work comfortably with classic and contemporary spaces alike. Perfect for use as a pendant over dining room tables, kitchen islands, and other contemporary living spaces. This industrial style light is supplied by Elstead Lighting and designed in the USA by Kichler who were founded in 1938. They design beautiful home lighting products featuring award-winning craftsmanship and unparalleled quality, such as the Cobson industrial 1 light mini pendant ceiling light in olde bronze finish you see here.